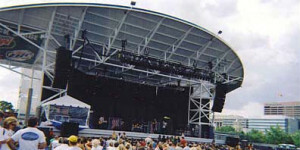 Since 1999, Milwaukee’s Summerfest has been recognized by Guinness World Records as the world’s largest annual music festival. Over 700 bands perform during the 11-day event each year, and some of the most popular artists in the world have played on one of the 11 stages. As a kid growing up in Milwaukee, I dreamt I was one of the rock stars on that stage, entertaining the thousands of people in the audience. This dream actually came true in 2002 when my band, Myopic Son, which was founded in 2000, had our first opportunity to play the Big Gig. As both the drummer and the booking manager, this was a huge accomplishment of which I’m still proud today. How did we do it? And what does this have to do with you and your business? 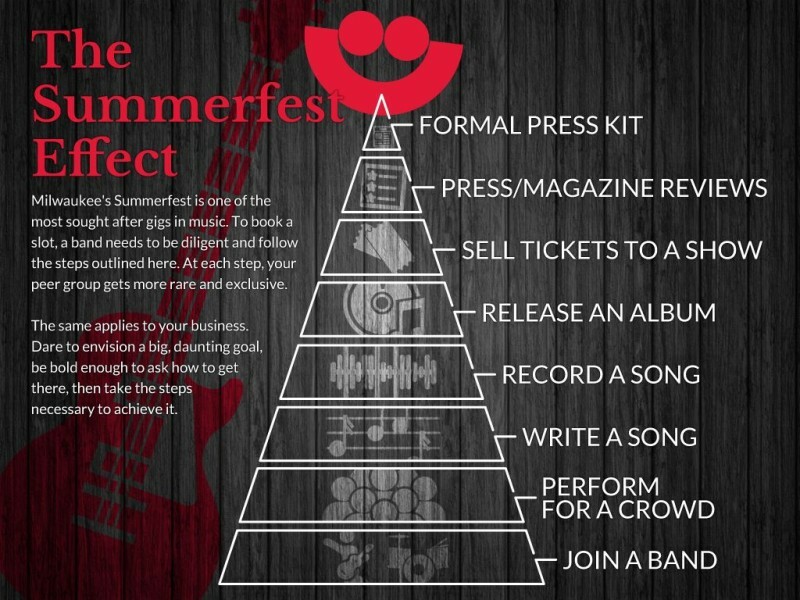 In this article I’ll share how to use the Summerfest Effect to build your brand, and how I became a Keynote Speaker by using this idea. It’s very, very exclusive. Summerfest is run so incredibly well, and it’s a different experience playing on a huge stage with such great sound. Our band performed on the second-largest stage on the grounds (capacity ~6000) and as a result, the fans we already had and the fans we earned during the performance saw (and heard) us in the best possible way. The experience, then, is unique and ultimately memorable for both our band and fans alike. There are incredible networking opportunities. With 700 different bands coming through Milwaukee over 11 days, the bands themselves, their managers, their agents, and all of their support staff are available on-site. Since there are no rock band trade shows, this is as close as you can get to a rock Chamber of Commerce event. Everyone wants to play in Milwaukee during the summer. Since those of us in the Midwest realize we have a finite period of outdoor time every year, all the great shows happen during the summer. Logistics for a band play a huge role in their touring schedule because of the sheer amount of people, gear, and merchandise that need to travel. Once the Summerfest date is booked, the rest of the summer schedule can fill in around it. A Chicago show the day before, a Minneapolis show the day after, etc. So how did our band get to perform at Summerfest? Yep, it’s really as simple as that. Of course, we had to qualify in the minds of those responsible for booking us, but by asking, they gave us a step-by-step road map of what to do. 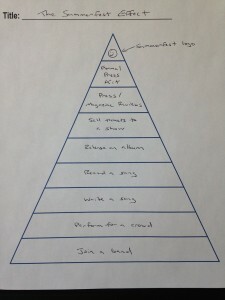 From that road map, I developed a hierarchical pyramid, and starting at the bottom, worked our way up. Please see the graphic attached of The Summerfest Effect that we built and followed. As you move to each step, the peer group gets more and more rare and exclusive. Don’t assume anyone will ever give you anything because you think you deserve it. You need to find out what they want and help them get it. When you trust a third party to do your work on your behalf (like the band managers she mentioned), things will never go quite as well as if you did them. If it’s critically important to the success of your endeavor, you just need to make the time to do it. I’m convinced that many businesspeople – the band, in my mind, was the ultimate entrepreneurial endeavor & business – get in their own way a lot of the time. Because Summerfest is such a big deal, a lot of the other bands that we knew at the time simply didn’t even try to play there. Why? Although they would probably never admit it, they might not have been good enough in their own minds. The last part of that sentence is so important. Our band wasn’t better than any of the other bands that we’d consider our peers. We were just bold (naive?) enough to expect to play at Summerfest if we asked the question and followed the advice we were given. That naiveté served us incredibly well in the success of our band. After all, why wouldn’t someone want to hear the music we wrote? This is what ended up happening to our band after Summerfest. Once our band had been vetted by Summerfest, no one needed to worry if we were good. When someone wasn’t calling us, we were calling them to let them know we could help them check a box off of their to-do list. Even if we didn’t perform well – which fortunately never happened – the person responsible for booking us could say, “I’m not sure what happened, they played Summerfest, and that’s a lot bigger event than our event.” After we put on a great show, then, we helped make that person feel good and look good to their peers. Isn’t that what we’re all trying to do in business? Whether our customers are businesses or consumers: people want to check off a task as “done” and feel good about it. If this person is making a decision where their boss will ultimately hold them responsible, isn’t looking good (i.e. not doing something that will get you fired) one of the most important goals? Here’s what I propose you do to create your own Summerfest Effect – find a big, daunting goal that would scare most people and find out how to do it. Don’t stop until it’s done or until you decide it isn’t important anymore. If it doesn’t scare you at least a little bit, then you’re not thinking big enough. Maybe it’s speaking at a trade show or industry event. Maybe it’s winning the business of a big-name client that most of your competitors would be scared to call. Maybe it’s the book you could write from your experiences in your business.